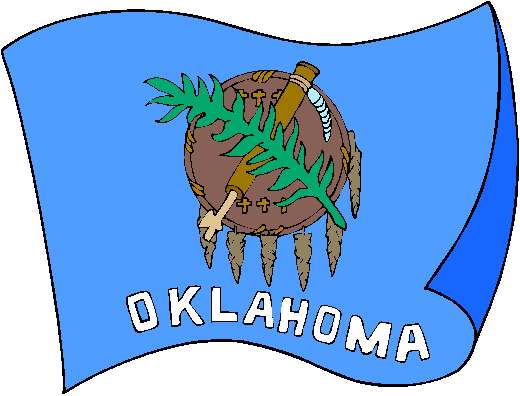 The flag of Oklahoma depicts an Osage Nation buffalo-skin shield on a sky-blue field, beneath which is the word "OKLAHOMA". The shield has seven eagle feathers, six crosses (the Native American symbol for stars), and is covered by two symbols of peace (the peace pipe for Native Americans, and the olive branch for Europeans). Additionally, the blue field was chosen to honor the first flag flown by any Native American Nation, namely the Choctaw flag which was flown during the American Civil War. A flag similar to the current design was the winner of a competition held in 1924, and was officially adopted by the state on April 2nd 1925. The word "OKLAHOMA" was added in 1941.